Dixit Odyssey gives players the chance to choose the whimsical and dreamlike art that matches the storytellerâ€™s tale, then see if they can find the storytellerâ€™s card among all those before them. Using your imagination and wit, journey through wild and magical new worlds and rediscover the brilliance and wonder of the original. 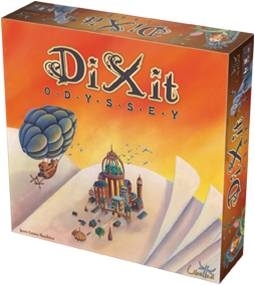 Dixit Odyssey can be played as either a standalone game or an expansion of the original Dixit. The new box design is made to encompass everything: if you own the cards for Dixit and Dixit 2, you can combine them all comfortably here. The new cards are great, quite in the same vein as the previous releases, and a lot of nice little touches have been made to tweak the ease of the game. A new pegboard scoring card is provided, which allows up to twelve players, and the board has been simplified to eliminate confusion when moving the rabbit pieces around the board. If you're new to Dixit, this is a great place to start; if not, you're probably sold already! This was the perfect buy for me as a game player and a collector. I loved the original Dixit game and the extra cards in Dixit 2. This game adds just as many cards but also new materials to support up to 12 people for scoring. I also liked that the box neatly fit all 3 games. Get this box to complete your game or start the collection.